Two days after Christmas, there was a bubble-wrapped gift remaining for two teams. In their first 10 games, the Indiana Hoosiers have a horrible loss coupled with some quality wins. Those facts put them squarely on college basketball’s bubble before conference play begins. The Georgetown Hoyas are likely in the NCAA Basketball Tournament if the season were to end today, but their conference schedule will offer less opportunities for résumé building than the Hoosiers. 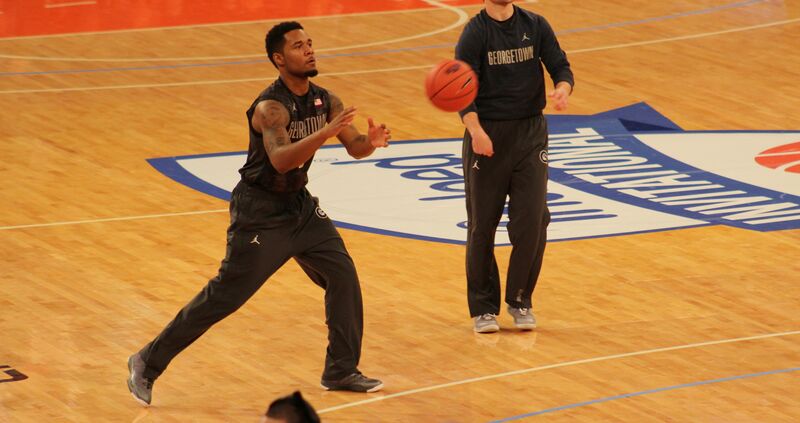 Georgetown didn’t want to flip the script at Madison Square Garden. The Hoyas wanted to hold serve in college basketball’s highly subjective and analytic landscape. These two historic collegiate programs matched up at MSG in a great game that went to overtime just hours after Santa Claus stopped time nationwide. Indiana proved that it has a true triple threat in this game. 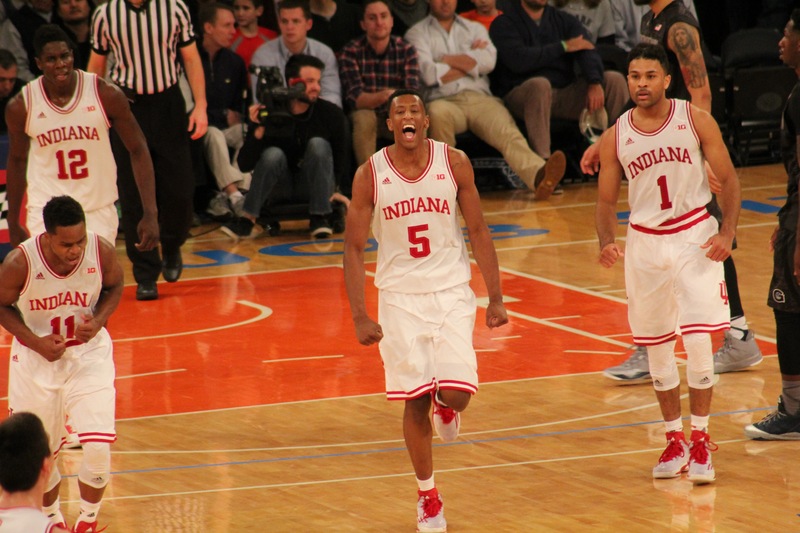 Yogi Ferrell (pictured), Troy Williams and James Blackmon Jr. scored a combined 72 of the Hoosiers 87 points. 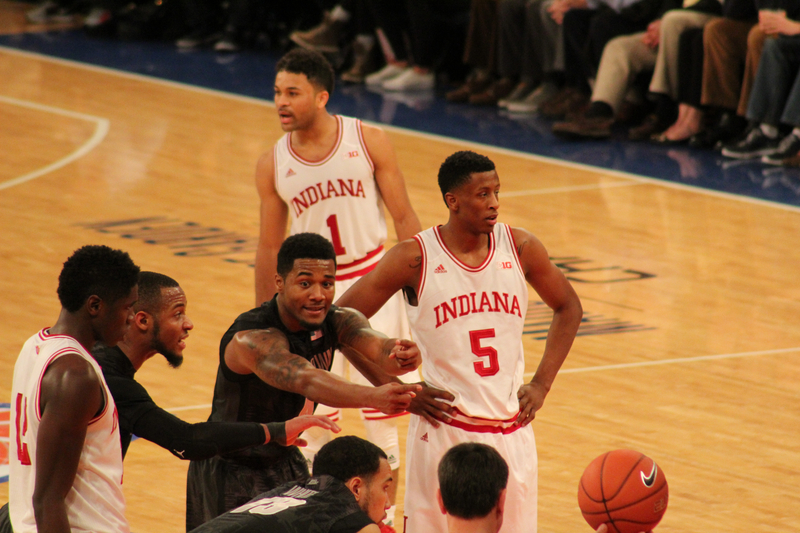 What concerned me about the Hoosiers was the lack of production offensively in the paint. Former Oak Hill Academy star and 6’7″ forward Troy Williams even played point guard at times. 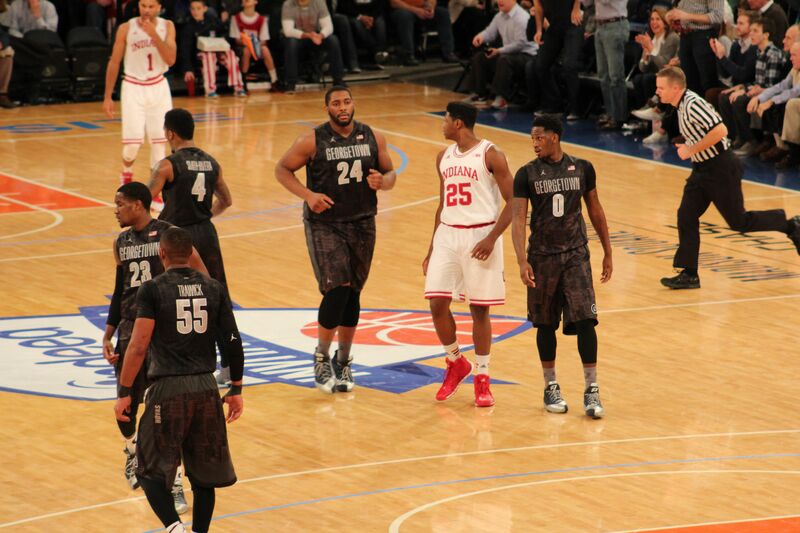 Hanner Mosquera-Perea, Indiana’s center, scored just two points. This told my eye test that the Hoosiers struggle to match inside scoring threats. Cue Joshua Smith. As a New York Knicks fan, this guy reminds me of Eddy Curry. Yes, he has size, but basketball fans wait for him to truly dominate. His 14 points were good enough to get Georgetown a win in this contest. Not to pick on Mosquera-Perea, but he had trouble getting assistance defending the rim. Not only did Smith score 14, but forward Aaron Bowen scored 22 off the bench (many at the rim). D’Vauntes Smith-Rivera had an amazingly-efficient 29 points. He shot 50% from the field (9-18). But that’s not what’s most impressive. He went 5 of 7 from the 3 point line as part of that high efficiency. Honestly, being at the game, I still didn’t realize how many points Smith-Rivera dropped because he didn’t hog the ball. His shots came in the rhythm of the offense. 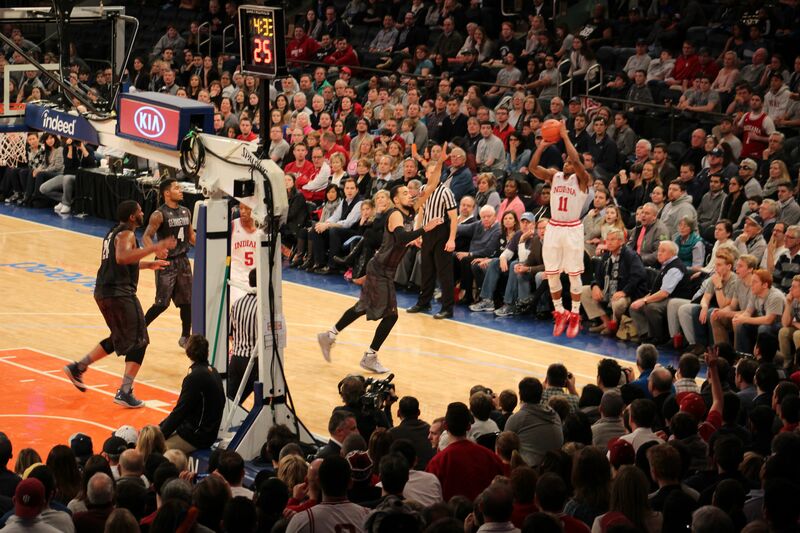 This was a magical holiday showcase at the World’s Most Famous Arena. I will forever remember how I watched a future NBA lottery pick in Troy Williams. This kid looked like Tracey McGrady around the rim and played point guard late in the game when good possessions mattered most. This photo (above) was taken right after his running floater tied the game up late. Ferrell, Williams, and Blackmon Jr. (pictured left, center, right respectively) would be a top 10 college basketball team next year if they would all return to school. However, the lack of production and defense in the middle makes me hesitant to think they’ll make a Sweet 16 run. I hate to say it, but I feel the same about the Georgetown Hoyas. I think that this team is not Sweet 16-worthy. Any team with a valid post scorer can find a way to get Josh Smith into foul trouble. Without his 14 points, and magnetic size down low, this is a different game. 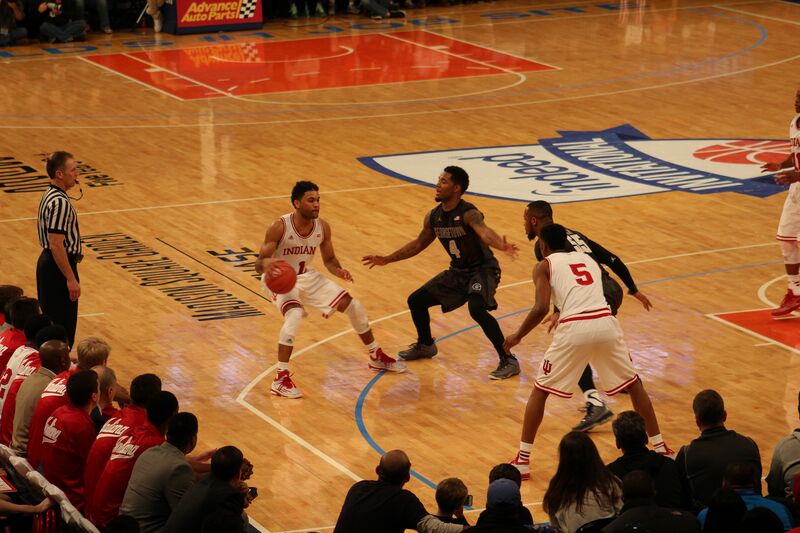 *Forgive me for not writing more about James Blackmon Jr. This freshman is so smooth, he calls for his own article some time in the near future.